My family on the east coast tells me its in the upper 80s. Here in LA, it's in the low 80s. Spring, apparently, sprung. Seasonably speaking, it's time to find the grill and get some rosé in the house. At this point in the year, chances are you can still find a lot of last year's rosé on the shelf. As long as the wine store has been storing them properly, that's not a problem. So head over to your favorite wine retailer and pick up a pink wine to enjoy this weekend. One that you might be able to put your hands on is the 2008 Château Viranel Saint-Chinian (suggested retail $13; available for $10) Made from Syrah, Grenache, and Cinsault, this wine epitomizes the sunny, Mediterranean feeling that I want from my rosés. It is true salmon in color, and has aromas of rose petals and raspberries. These elements are echoed in the palate, and there are nice stone notes in the aftertaste. Dry, refreshing, and perfect for charcuterie, salads, grilled sausages or just plain sipping on the patio, this wine has very good QPR--and excellent QPR if you can pick it up on sale for around $10. I love rose and am currently on the East Coast -- I think I'll be taking your advice this evening and firing up the grill while I sip on some rose :) Already have it chilling in the fridge. Nice to see someone not afraid to recommend a Rose' wine! I think it's gotten a bad stereotype as being cheesy or tacky, when nothing could be further from the truth. Must add this to my summer sipping list. Just cracked open the Charles & Charles 2009 Rose from the Columbia Valley. It made the jump from my shrimp orzo right to my strawberry pie. Ain't nothing cheesy about this stuff. It's even got a screw top and I think that's just cuz they want you to get to the good stuff faster! My problem with rosè wines is that sometime they finish quite bitter. However last week I had a pretty nice one: the Francis Coppola Sofia. I love a nice rose in the spring/summer (and it has definitely transitioned to Spring here in NYC). Thanks for the inspiration - we will open a rose this weekend! That's a great info man, hoping for not too expensive roses. Spring is the perfect time of year to sip on Rose. Thanks for the recommendation! Good news for wine lovers, now you can make investment by storing wine. I like your blog. Cool. Picnic Time has a wide variety of Wine Baskets and Wine Totes to choose from check out www.picnictime.com to see whats new! Nothing like a good Rosé! I noticed that my friends blog quaffability is listed in your blogroll. He is no longer running his blog. The wine goblet would love to be listed as resource! I would love to do a post on my blog about "good wine under $20" would you be interested in writing this? I look forward to hearing from you. 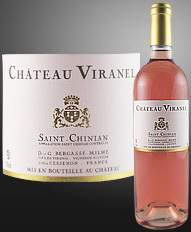 This 2008 Château Viranel Saint-Chinian sounds great...gotta get my hands on it for the warmer weather! Have you tried Peju's Rose of Syrah by any chance? This is another dry option and sourced from a small Syrah block. I have found it for $18. I highly recommend two Oregon Roses of Pinot Noir... Lenne Estate and Appoloni. Freaking awesome and the QPR is off the charts!! Also, I'm not sure if you've heard of Montinore Estates in Oregon, but their 2009 Pinot Noir ( biodynamic estate wine ) is about 9-11 bucks a bottle and is easily the best 2008 Oregon Pinot I've had to date under $40. Its great informative and useful tips..thanks a lot..keeps going on…… I invite you to see my post, I hope you will find interesting too. As a red wine drinker I have found rose wines a good alternative for the summer. Thanks for the suggestion of another rose for me to try. I look forward to it.